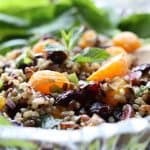 This Mandarin Wild Rice Salad is a hearty autumn salad with cranberries, pecans, green onions, chopped mint and mandarins with a delightful orange vinaigrette. It makes a perfect side for Thanksgiving or anytime really as it goes great with many fall and winter dishes! To make the salad – combine in a large bowl: rice, mandarins, onions, cranberries, pecans and mint. To make the dressing – combine in a liquid measuring cup or salad cruet: orange juice, balsamic vinegar, garlic, salt, and pepper. About 2 hours before serving, spray about 4 sprays of the olive oil on the rice and mix. Add the dressing. Allow to sit for 2 hours at room temperature. Immediately before serving, line a pretty bowl with spring lettuce or fresh spinach. Add the rice mixture. Garnish with a piece of fresh mint if desired. You can make this recipe up ahead of time but leave out the mint and pecans until the end (to keep them crunchy) and keep the dressing and salad separate until about 2 hours before serving.